This cartoon is not funny. War is not funny. Especially the prospect of WWIII. I was not happy with the Syrian bombing and I caught a lot of flak for my cartoon that criticized the event. As a political cartoonist, I have to call it as I see it—even if it means losing support that I badly need. I drew a great many pro-Trump cartoons to help him get elected. I still back Trump and his intention to make America great again, but one critical cartoon cost me in terms of lost donors. Trump recently said he had no intention of starting another useless war in the Middle East—and that’s reassuring, but now we have North Korea to worry about. 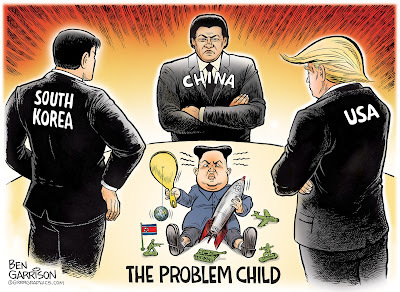 Kim Jong-un is a spoiled, capricious nut. His nuclear war threats may be nothing but continued ego maniacal saber rattling, but once nuclear miniaturization is achieved, he could launch a nuclear attack on our west coast. Many have suggested diplomacy, but that has already been tried for decades. North Korea always furthers their nuclear capabilities regardless. He may be trying to extort us once again for more food and fuel, but again..that tactic simply does not work. It only buys the regime in North Korea more time. I've read two books that I recommend highly: “The Aquariums of Pyongyang” and “Escape from Camp 14.” If you read either book, you’ll get a good idea of the fear and tyranny under which the North Korean people must live. Kim Jong-un grew up as a pampered egomaniac. He is reckless and dangerous. He even wanted all males in the Communist country to wear his own crazy haircut. He needs to be taken out, but that’s a very risky undertaking. China is key. If they don’t help us take out Un, then we definitely have a chance for WWIII. I’d much rather see Trump concentrate on making America again, but the constant threat of nuclear war from a deranged tyrant could ruin all that. We live in very dangerous times. I never thought anything in the world could make me sympathetic to Kim Jong Un, but your latest comic did. I'd be fighting for my life if I was surrounded as you depicted him. Your comics were a source of inspiration for me throughout Donald Trump's historic campaign, and your last one gave me hope that Trump's supporters would lead him back into the light. As Trump's people are talking openly about murdering Jong Un, you cheer them on. Please do some studying on Kim Yong-un and his vile regime. He's a mass murderer. He murdered his own brother. He killed a top official with an anti-aircraft gun. Please read "The Aquariums of Pyongyang" to know what life is like there. He's a monster and I for one will welcome his destruction.